All FAIRWAYS OF SONTERRA homes currently listed for sale in San Antonio as of 04/22/2019 are shown below. You can change the search criteria at any time by pressing the 'Change Search' button below. "Highly coveted Sonterra, in the heart of Stone Oak amongst EXEMPLARY Schools, Medical District, Golf & minutes to 1604/281. Stately Burdick Masterpiece with opulent finishes, upgrades & design with seamless transitioning through interior/exterior. 4,214 sq/ft, No carpet- ALL marble/wood flooring, 3 car garage w/ maid's bd/ba, 2nd mstrbd, game room, gas cooking, Thermador/Subzero, Carrara marble counters & SENSATIONAL Owner's Suite! Golf cart access to Club at Sonterra! Luxurious LIVING starts NO"
"Wont last long, You'll get instant equity, priced over $50,000 under assessed value, Beautiful one story home, with large entertaining areas, two car garage on each side of the house, Large master bedroom with fireplace and walk in closet, the Study is used as an additional bedroom. Golf cart access to country club, with two 18 hole golf courses, Restaurant, pool, gym and other amenities, membership separate." 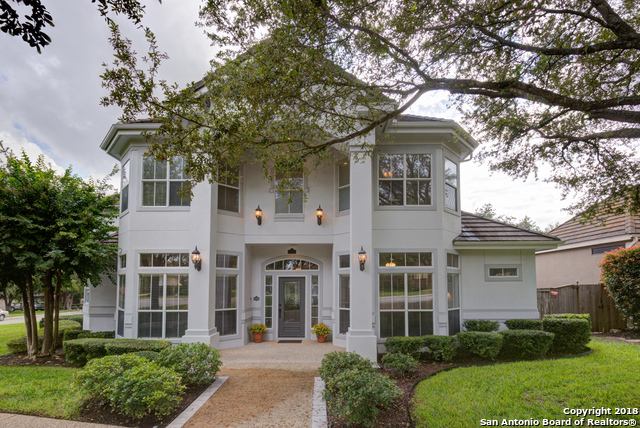 "Rest assured knowing that all of the work has been done for you in this gorgeous home conveniently located in The Fairways of Sonterra and NEISD. The attention-to-detail is sure to be on-par with all of your expectations for a home that's a golf cart drive away from The Club at Sonterra. Entertainer's delight w/ open & bright floor-plan, outdoor kitchen & sparkling pool. New privacy fence. Lovingly remodeled, please see attached document with additional details!"